Garth McVicar is a very accomplished speaker, stating "I stand up for what I believe and want to make a difference". He spoke to Tawa Rotary at the 10 November 2015 meeting. Garth and Anne McVicar established the Sensible Sentencing Trust (SST) in 2001 as a response to their concerns about escalating violent crime and deteriorating social standards. Garth's ambition has been to help victims of crime, and he emphasised that public safety must be paramount. Garth spoke about the trigger for SST that had 16000 people showing their support at a rally for the Cardno case in 2001 in response to the police prosecution of Mark Middleton. SST grew from there. He is pleased to note that government is now talking about putting victims at the centre of the justice centre. Garth is evidently passionate, determined and committed. With many legislative reforms to their credit the SST is now turning its sights on exposing and reducing the horrific level of sexual abuse of children. In 2008 Rotary honoured Garth with the Paul Harris Fellowship award and he was also awarded Toastmaster of the year. 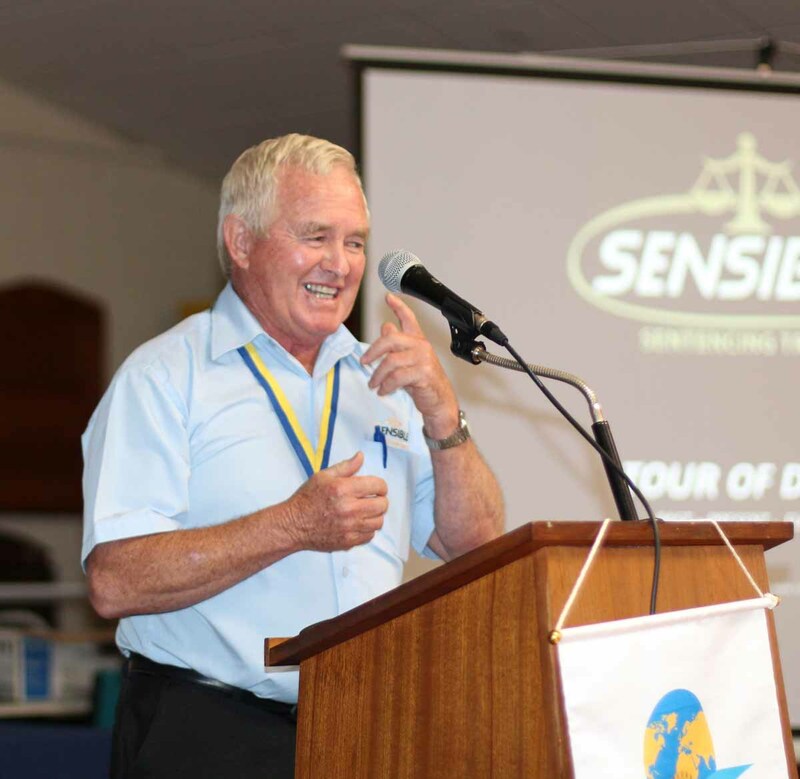 On 17 November 2015, we welcome PDG Graeme Blick, District 9940 Chair for Rotary Foundation. 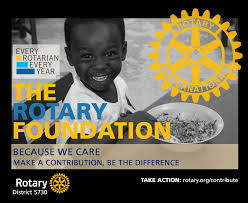 The week of 15 November is Rotary Foundation Week – designated by Rotary International back in 1956, that was then extended to the whole month of November starting in 1983-84. 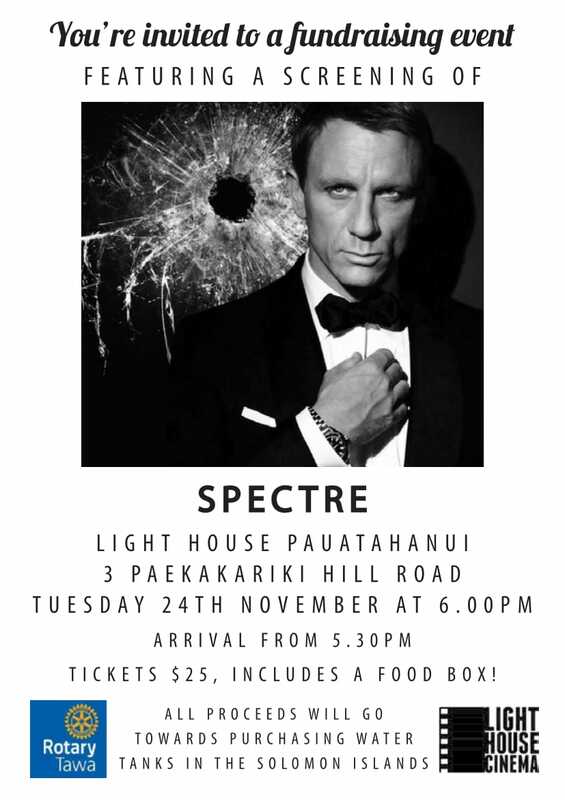 Cost $25 includes a 007 food box! Bring along your friends, neighbours, family. Less than half the tickets are sold and it’s going to be a great night out. Judith will have tickets available at Rotary on Tuesday 17 Nov. If you are not going, please email Judith. Back by popular demand is the “Pot Luck Progressive Dinner” on Saturday 12th December 2015, from 6.30pm. To refresh your memories and as the name suggests, it is pot luck. That means attendees do the cooking and keep us all guessing! And also ‘progressive’ in the name suggests attendees are on the move, in other words go from house to house. So to outline the event, there will be three homes for entrees, three homes for mains, and then a central home for dessert and coffee. Each couple will be allocated their venues (and timetable) to attend, and one of those venues to provide their ‘pot luck dish’. Being as we are responsible drivers, and conscious of the new drink driving laws, the emphasis of the event is food and fellowship, but you are welcome to assist with BYO. Malcolm invites offers of hosts, and Club Service believes hosts don’t need to provide a ‘pot luck dish’, but perhaps a few drinks. Otherwise there is no cost. Hope you are all able to attend - we will be contacting you all in the next few days to see if you able to join us. Any questions please contact Malcolm Andrews. Original generation time 1.5757 seconds. Cache Loaded in: 0.1502 seconds.